Melissa Click is an assistant professor in the communication program at Mizzou. When she's not conducting groundbreaking research on Fifty Shades of Grey, Melissa Click is demanding that student journalists leave public areas and then, when they refuse, she calls in "muscle" to have them removed. No, literally. She did that. When a journalist refuses to leave a public space, she screams out "I need some muscle over here." To harass them and get them to leave, by any means necessary. No wonder her crybaby wards are always whinging on about safe spaces. Safe spaces as swords? Deeply amusing. Seems like a tactic police officers might want to adopt, no? Seriously, though: The next time a cop tells someone to quit filming them when they're in a public space, he should launch into a lecture about how being captured on film without his permission makes him feel. That should be comedy gold. Also comedy gold? If you believe in freedom of the press, you're just playing into the corporate game. Thank God professors are here to open our eyes. Anyway. Good times. 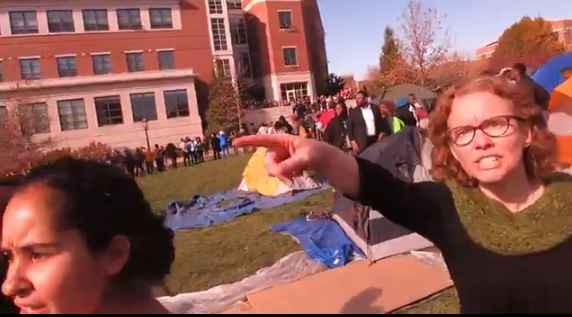 Keep up the amusing work, Mizzou.